Home » Traveling Soon? Prevent Your Family From Bringing Home Bedbugs! If you live in New York City or are planning to travel there, the bedbug outbreak probably has you concerned. According to the extermination company Terminix, New York City is the most infested city in the US for bedbugs, outdoing even Philadelphia, Detroit, Cincinnati and Chicago. 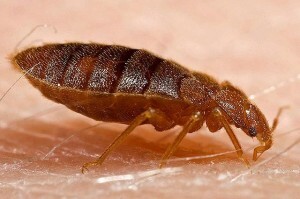 Bedbugs were thought to have been eradicated in the US nearly 60 years ago. However, international travel has brought the bugs back into the US with a vengeance. It only seems obvious that cities with large numbers of international travelers coming through would have high infestation levels. Terminix, however, says the bugs are making their way into less populated areas as well. “It’s the bedbug problems in cities like Dayton and Louisville that prove bedbugs are back and can pop up anywhere,” said Paul Curtis, the etymologist for the company, referring No. 8 and No.13 on the list. Bedbugs tend to hang out in airports where they can move from one host to the next, spreading across the country fairly easily. Getting rid of the pests can be expensive and a lot of work. Bedbugs can show up in hotels and motels, and this includes higher priced chains as well as lower ones. Before crawling into bed, check the sheets and blankets on the bed for signs of the bugs. They are small, about the size of an apple seed. 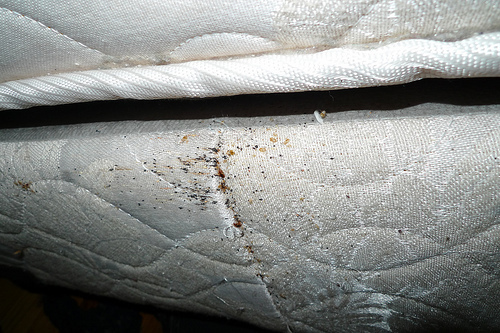 Bedbugs leave spotting, tiny drops of blood that can appear on sheets when bedbugs are present. Travelers should also inspect the mattress for signs of the bugs and report them immediately to the hotel staff. When you and your family return from vacation, make sure that every gets washed thoroughly. This includes all clothing, blankets, and stuffed animals that your children might have brought along. Even clothing that stayed in your luggage can become infested as bedbugs can crawl into the cracks of bags. Bedbugs prefer warmth and will seek out places that are warm and dry. Laptops, portable DVD players, and children’s video game units can all become hosts to bedbugs and follow you home. Parents may need to take electronics in to be professionally cleaned. If you do bring bedbugs back home with your family, getting rid of them requires working in multiple areas of your home. Cracks and open spaces need to be sealed off. Infested clothing and furniture needs to be either disposed of, or cleaned in a high-heat intensive manner. Carpeting will need to be vacuumed frequently, and the contents of yor vacuum should be disposed of outside of the home. Steam cleaning and heating items to over 140 degrees Fahrenheit will kill many bedbugs, as well as using chemical insecticides and disinfectants across your home. Parents with small children, however, may be extremely wary about using these in the home.